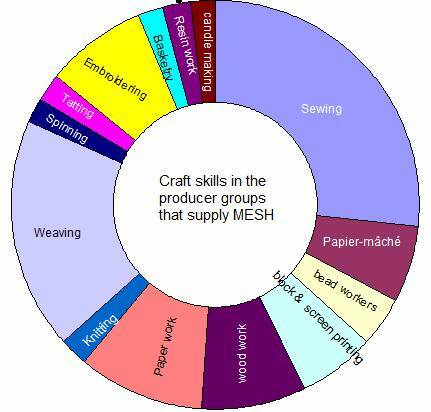 Find out more about the producer groups that MESH works with and buys from. Click on the sub menu to find out more about each group. This is not exhaustive, we shall be adding to it. 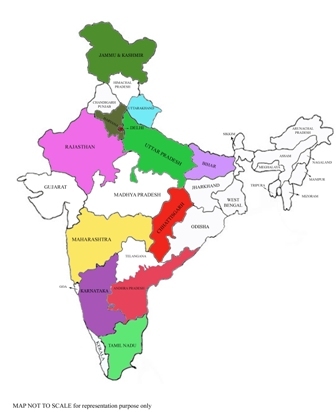 In 2014-15 MESH bought products from 34 producer groups across 11 Indian states. Each producer group works especially for people affected by leprosy or people with disabilities. Some are integrated groups of marginalized men women who work alongside people with disabilities; others are employing only people affected by leprosy and their family members. The coloured areas on the map below indicate the states where the producer groups that supply MESH are located. There are many skills among the artisans in the groups and many types of products are created for the domestic and export market. Some groups are large and run with strong management and high levels of organisation, others are tiny, self run, self-help groups who need much more hand holding. All of the producer groups are autonomous and work independently of MESH. We help them with marketing, design and capacity building as necessary. We are delighted to work with them and proud of them all.